The Sumerians hailed from Sumer, also called Sumeria. Before the Sumerians, the Ubaidians lived in the area. The Ubaidians shuffled direction northwest (approx. where you can see the word Mesopotamia on the map) and new folks settled in the neighborhood. These people were the Sumerians. The year? Around 3300 BC. When people use the word Mesopotamia, they usually refer to the entire area between Euphrates and Tigris, all the way down to the Persian Gulf. Hence, the terms Mesopotamia and Sumer are used interchangeably. But if you want to be exact, Sumer is the southern part of Mesopotamia. And speaking of different terms referring to the same thing, Old Babylonia often equals ancient Mesopotamia, because Sumer later became Babylonia. 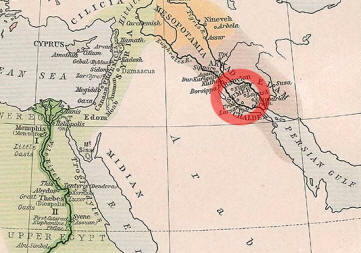 Kish, Erech (also called Uruk,) Ur, Sippar, Akshak, Larak, Nippur, Adab, Umma, Lagash, Bad-tibira, and Larsa. The big achievement of the Sumerians, and their legacy, was the wheel, their writings on clay tablets in cuneiform, and the general concept of law codes and city-states. Good question. Nobody took a picture. But we know that around 3000 BC, the Sumerians darted across their soil in chariots. Probably the most famous Sumerian was Gilgamesh. And speaking of Sumerian literature: Provided by the University of Oxford, here are nearly 400 literary works composed in the Sumerian language in ancient Mesopotamia during the late third and early second millennia BC. What Happened to the Sumerians? After the Sumerians, the Elamites, the Akkadians, the Gutians, and finally the Amorites took over. The year 1900 BC roughly marks the end of the Sumerian civilization. By 1600 BC, the Babylonian Empire dominated.